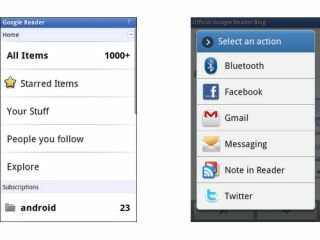 Google has finally released an official version of Google Reader for the Android platform. Considering that it's been two years since Market opened for Android, it's taken Google a long time to develop a mobile version of its popular RSS reader. But it's finally here and offers pretty seamless and fast integration. Peter Baldwin from Google said about the new app: "It's been a long time coming, but the official Google Reader app for Android is finally here. "The app supports all the basics you'd expect, like unread counts, friends, sharing, liking, and starring." Other features on the app include: Multiple accounts, synced preferences, full subscription features and search. There's some new mobile bits, including the ability to navigate your feeds with your handset's volume key and you can also send to services such as Facebook, Gmail and Twitter. The Google Reader app is available now from Android Market. Earlier this month, Google also announced Android integration for Google Docs.